When the Behringer X32 digital mixer first came out, I took one look at the price and just knew it had to be a hoax. I have found Behringer equipment to be hit and miss when it comes to quality and I knew this one must be a miss. I dreamed about having a digital mixer – scene saving, motorized faders, compression and parametric EQ on EVERY channel…but our small church budget just couldn’t absorb a $10k+ mixer. Then the Behringer X32 was released at just over $2k. I just knew it would be missing features, but as I examined the specs, nothing was missing. 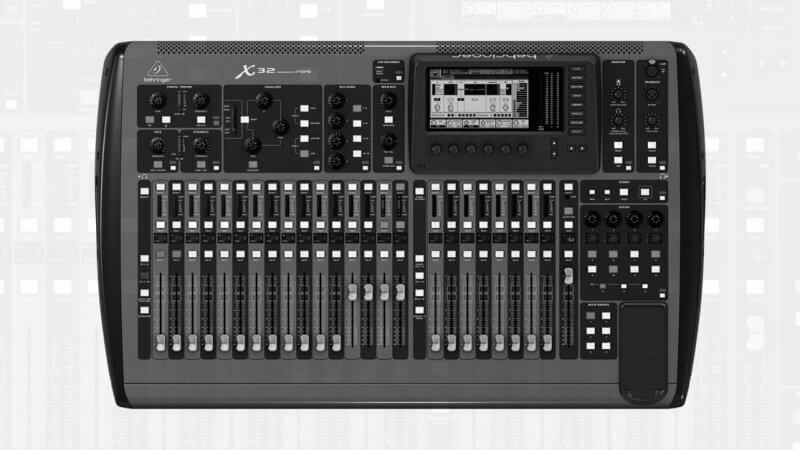 I let several years pass before finally purchasing the Behringer X32 mixer for my church. After hearing countless worship leaders rave about this mixer, I decided it was time to give it a shot – and it has been a pleasant surprise. 4-band parametric EQ on EVERY channel – With an analog mixer you would have to purchase a rack-mountable parametric EQ unit for every channel to get this same result. Talk about a money and space-saving feature! It is amazing to have the ability to get every vocal/instrument dialed in just right. Compression and gate on every channel – Using the compression and gate features are key to mixing controlled vocals and getting your drums and bass guitar sounding amazing. The Behringer X32 gives you this functionality on every single channel. Amazing built-in effects – Great reverb makes a huge difference in the quality of your mix. At the low price point, I assumed the Behringer X32 would fall flat in this department, but I was wrong. The built-in reverb and delay sound absolutely beautiful. And, the versatility is incredible. Scene and preset memory – I used to be worried that the sound tech would forget what needed to change between songs, but not anymore. The Behringer X32 allows you to save every setting on your mixer. Then you can recall with the click of a button. So, we simply save our presets during rehearsal and the sound tech is able to quickly recall each mix before the song begins. On top of this, you can save specific channels as presets. This is especially handy when you have different vocals each week using the same channel on your mixer. Mix on an iPhone, iPad or Android device – Simply connect a wireless router to the Behringer X32 and you can mix from anywhere in the room on your mobile device. The musicians can now use their own phone to control their own monitor mix – no more shouting back to the sound tech. 16 bus mixes – Most analog mixers only have 4 aux sends for monitor mixes. The Behringer X32 has 16 bus mixes that can be used for monitor mixes. Finally, everyone can have their own mix. Or, for even better results, get everyone on your team a P16-M personal monitor mixer. Easy recording – We used to use an audio interface to record the sermon on the computer that runs ProPresenter. Now we can just plug a USB drive into the Behringer X32 to hit record right on the mixer. Less room for error and much easier to work with. Virtual sound check – The Behringer X32 allows you to record all 32 channels (raw signal) simultaneously. This enables you to record a rehearsal and then come back the next day (without the band) and fine-tune your mix. Now, you must have the right software and a good computer to make this happen (like a MacBook Pro with ProTools), but this is extremely helpful – especially for training new sound techs. Live recordings – If your worship band wants to produce a live album, the Behringer X32 has everything you need to make it happen. Simply record all 32 channels of raw signal and send it all to the recording studio. With all the available features, the Behringer X32 is a bang for your buck, no doubt. Thank you for this review of the Behringer X32, Kade! My small church uses a Mackie TT24 for mixing. I would love to learn more about what our Mackie can do and how to do it. For instance, you mentioned mixing on an iPhone or an iPad. I’ve always wanted to be able to do this on our Mackie so I can walk around the auditorium, during rehearsal, and make adjustments, remotely. It’s just been hard to find and spend the time to figure it out. I wonder if hooking up a wireless router to our Mackie will make mixing on an iPad possible… I’ll have to look into that. Thanks for the idea! Interesting article! Thanks for the review Kade! Your help is very much appreciated. I’m wondering if Rolls could be used with this or would I need to upgrade to wireless in-ears as well. Hey John – you can definitely use the Rolls setup with the X32, but I’d recommend upgrading to the P16 personal mixers if budget allows. Your headphones will still be wired, but you will have much more control over each personal mix, and the mix is in stereo (you can pan some stuff to the left, some to the right, etc). question. My church is looking to upgrade to the X32 and i wanted to know if 1) do you use a digital snake yourself? 2) If you do use a digital snake, can you use the outputs to connect to the amps for the speakers from the mixer itself or do you have to use the outputs on the snake once you connect the snake? I ask because it would be nice to have the snake on stage but all the amps are at the other end of the room next to the board. so i just want to know if at that point would we have to run cables from the outs on the snake back to the amps near the board or can we just go straight from the board to the amps since they would be very close. Hey Matt – great question. With the digital snake, there is a variety of routing options. You can definitely set you inputs to run through the digital snake while setting the outputs to run directly out of the board. You can even set some of the inputs to come from the digital snake while having others come from what is plugged in to the board. This is all done on the ‘Routing’ screen of the X32. ‘Local’ refers to what is plugged into the mixer, whereas ‘AES50’ refers to what is plugged into the snake. Hope that helps! Very useful advice in this particular post! It is the little changes that make the most important changes.Thanks for sharing! If you are looking forward to buying out a digital mixer there is no better choice to make than the Behringer X32. This interactive and easy-to-use digital mixer has boomed in popularity over the last few years. There’s been an increasing amount of demand from people who want that incomparable sound that only a few mixer can produce. From high-quality motorized faders to a ton of channel inputs and buses the X32 has anything you’d need or will ever need from a mixer.